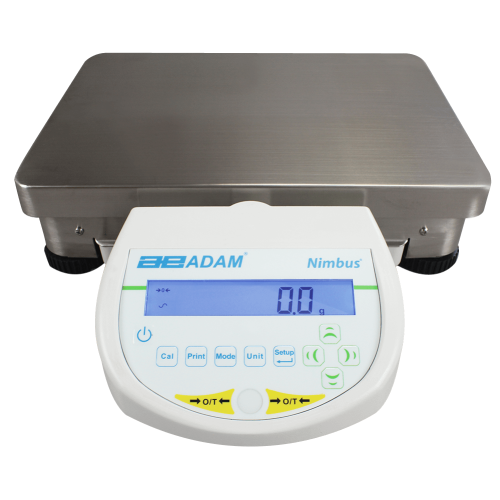 Adam's high-performance Nimbus top loading precision balance features a large, chemical-resistant stainless steel top pan and 0.1g readability. Ideal for laboratory materials testing applications. Nimbus balances feature a lightweight, compact construction which significantly reduces the footprint of the balance, making it easy to fit the balance on busy worktop areas or transport to new locations when necessary. The single-piece construction offers greater stability than standard balances for obtaining more accurate results whilst allowing chemicals and hazardous samples to be weighed with minimal risk of accidental spillage during handling. The weighing sensor in the Nimbus is crafted from a single block, and contains fewer parts than a traditional force motor balance. This optimised internal mechanism is fabricated using hardened materials, helping the Nimbus tolerate rigorous laboratory use. Efficiency in the mechanics, plus improved processing power of the electronics, leads to excellent performance. Nimbus top loading balances offer up to 0.1g resolutions for measuring small chemicals and samples. The stainless steel top pan is chemical-resistant and the balance comes with dynamic weighing features that can be used effectively when handling chemicals. The Nimbus top loading balance models include a larger weighing pan compared with standard Nimbus precision models. The balance can be fitted with a weigh below hook for carrying out density determination and gravity testing experiments on materials such as concrete.